I picked this kit up at the St. Ives show a few weeks ago. The first thing I did, which is totally out of character for me, was to purchase a full colour set of etched. Staying out of character, you will find later, that I even applied every one of the tiny stencils that came on the decal sheet. Overall, it is a very nice kit. Very well moulded with no flash. 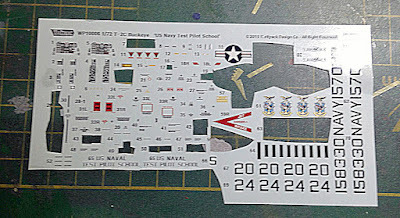 It has some very good full colour instructions (that include some full size aircraft shots) and a colour decal sheet that calls out every single stencil that is on the real aircraft. 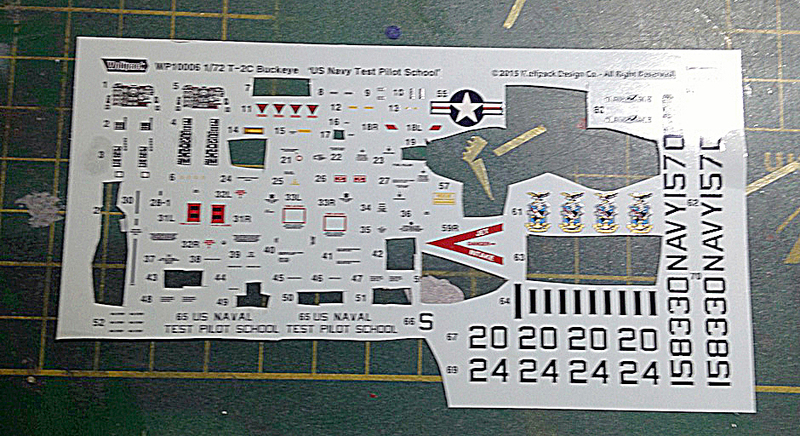 The decal sheet had 70 individual decals on a sheet that was 130 x 65mm! The first step was to build the cockpit. This required a decent amount of coloured etch and, because the canopy is so open, gives a very good result. Often, after doing all the work on a 1/72nd scale aircraft you find that you can't see anything when the fuselage is closed up. Not with this one so "tarting" up the cockpit was very necessary. The next job was to close up the fuselage and the wings before painting them. 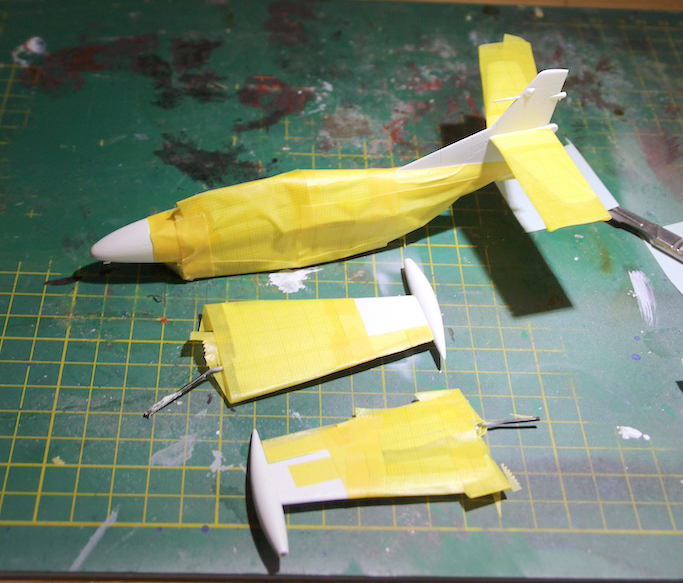 Fortunately, the wing fit was almost perfect as it was so I was able to continue with the build whilst keeping the model in three main parts. Having sprayed it all over with AK Interactive white primer, I carefully masked it all up for the red. Aside: I used to swear by Vallejo primers but the white I have is very insipid. I bought a bottle of the AK Interactive version at the Billericay show. So far I have found it much superior to the Vallejo version. 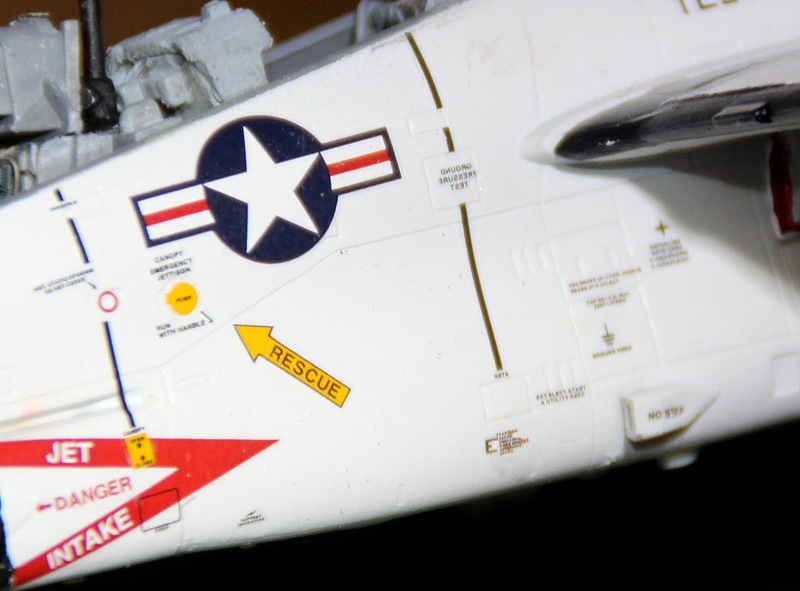 The underside of the port wing had to be carefully masked as the NAVY decal ran into the red area but was on a white background. Some careful measurement and planning got the whole thing correct. First off, I tried a new bottle of Vallejo Fluorescent Orange which is how the colour is called out. However, this was way too bright. 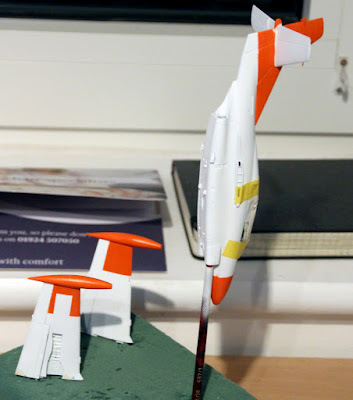 Fortunately, I had a brand new pot of Modelmaster International Orange that I had purchased from Relish Models ready for the build of the T-45 Goshawk that I bought to sit next to the Buckeye to make a nice pair. This was a much better option. The only problem was that I hadn't used enamel pains for at least 45 years so I didn't have any experience or thinners! Fortunately, it sprayed nicely out of the bottle and the airbrush cleaned up perfectly through the use of my trusty can of Liquid Reamer. I found a small problem with the enamel paint. It doesn't take very well to over painting once it has been airbrushed. The finish of hand painting is very different. Thus, I found touching up some of the masking bleeds to be difficult. In the end, I hand painted over all of the orange ares to get the same finish overall. Fortunately, I didn't have to apply much of a coat - just a light brush was good enough but it did regularise the final finish. Once this was complete, I moved on to decalling. As mentioned, I had decided to do the whole 10 yards so put aside an afternoon and made sure that I had had a nap so that I was wide awake. It took me 3 hours in the end but I did apply every singly decal and stencil that was called out. I have to admit that a couple of the tiniest ones got away once I had them wet on the backing but apart from that, everything is there. Here is a small area to show how many there were. Finally, the aircraft got put together and the undercarriage was added. The doors of the main gear had to have red outlines whilst the nose gear doors had to be part orange and part white to match the fuselage. This model was turning out to be a lot more complicated than it looked up front. The last job was to complete and mount the canopy. I painted the outside white and the interior dark grey to match the cockpit. I then fitted the strut to hold the canopy open. Lastly I attached both parts of the canopy using my trusty Gator's Grip glue rather than relying on getting Plastic Weld in the right place and not harming the glass. Finally, I fitted the tail hook! Now, why would I be doing that at this late stage. Well, there is a story here. Firstly, it is painted with black and white stripes. They do supply a decal but I tried and it was impossible to fit a flat, wet, decal around a tail hook. In the process, I managed to break the hook into two halves! I tried rebuilding but it was too thin and I couldn't get a good enough fix. So, I painted both parts of the hook and fitted the front end. I then fitted the back end but it fell of somewhere along the line so I kept it out of the way until I was finished. 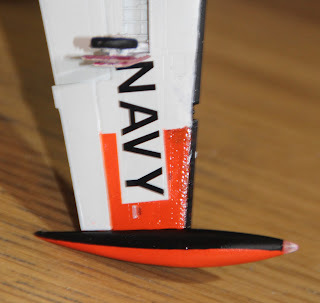 So, my very last action on the model was to glue the read end of the tail hook in place. Now, all I need is the Italeri T-45 Goshawk to sit next to it. That's a project for next month.